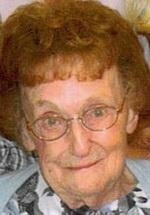 CEDAR FALLS - Ida Bisbee, 95, of Cedar Falls, died Wednesday, March 31, at Cedar Falls Lutheran Home of natural causes. She was born Sept. 2, 1914, in Coster, daughter of William and Jennie Van Heuvelen Smith. She married Ernest Bisbee Feb. 9, 1941, in Cedar Falls. He preceded her in death April 10, 1994. Mrs. Bisbee was a nurse's aide at Sartori Memorial Hospital for 18 years, retiring in 1968. Survived by: two sons, James I. "Jim" of Cedar Falls and John F. of Waterloo; a stepdaughter, Dianne (Fritz) Homann of Davenport; seven grandchildren; eight great-grandchildren; and two great-great-grandchildren. Preceded in death by: her husband; two brothers, Hiram and Koert Smith; and two sisters, Jane Smith and Frances Troutfetter. Services: 10:30 a.m. Tuesday at St. John Lutheran Church, with burial in Cedar Valley Memorial Gardens. Public visitation from 4 to 8 p.m. Monday at Dahl-Van Hove-Schoof Funeral Home, and for an hour before services Tuesday at the church. Memorials: may directed to the family or St. John Lutheran Church.